Oh my. These are really good. Addictive. 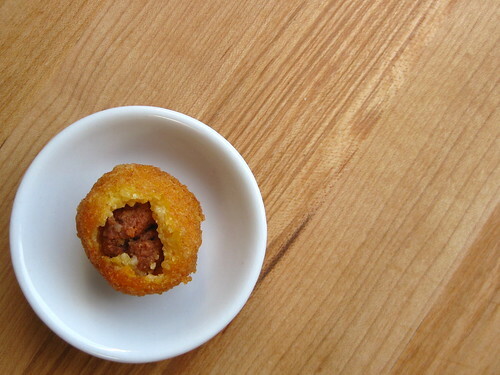 I can’t take all the credit, though, most of the heavy lifting was done by my favorite salumi artists over at Boccalone — their nduja is the pillar, or more accurately from a structural perspective, the delightful core of these arancini. Whip up a quick batch of polenta — making it more dry than you’d traditionally ever want to eat (in order to minimize splattering once it hits the oil) — stir in cheese — Piave, a younger Parm, Wagon Wheel (I think, if someone doesn’t eat the goods before you can cook with them … cough … David) — envelop small marbles of cured, beautifully seasoned, spreadable (!) salami and fry ’til golden and crispy on the outside followed by creamy and meaty as you progress through the layers. (Note to self: breathe.) And there you have it, a unique, easy-to-prepare appetizer, addition to an unconventional antipasti platter or, as I happily learned, a fabulous treat to make a regular-old-Monday wholly more enjoyable. In a small saucepan (2-quart) over high heat bring water to a boil. Stir in salt and Aleppo pepper, if using. Whisk or stir in polenta, breaking up any lumps. Return to a boil, then reduce heat to low. Cook — it won’t really simmer, but instead appear to be breathing (basically moving up and down, with the occasional volcano-like burst) — until very thick and almost crumbly, but sticky (about 10 minutes). Remove polenta from heat and immediately stir in Piave until evenly distributed. 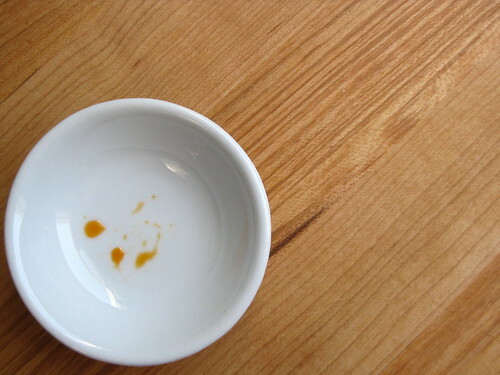 Grease an 8×8″ pan with a small amount of olive oil. Transfer cheesy polenta to the greased pan, smooth into an even layer. Cover pan with plastic wrap and set aside at room temp to cool. While polenta cools, remove casing from nduja. Form small, marble-like balls of salami, 1 packed teaspoon each. Refrigerate until ready to form arancini. When polenta is cool enough to handle, but still slightly warm (about 30 minutes), form the arancini. Portion out one tablespoon of the polenta and roll into ball (the heat from your hands helps warm it slightly, making it a little more pliable). Press ball out in your palm (if it sticks too much, wash then lightly moisten your palm next time) until it’s about 1/4″ thick. Place one piece of nduja in the center. Mold polenta over nduja and press/pinch polenta into a seamless ball — the polenta is quite crumbly, so it cannot be rolled like risotto-based arancini. Set formed ball on a lightly greased plate; repeat with remaining polenta and nduja. Allow balls to set, no need to cover, for about 1 hour at room temperature (alternately you may cover, refrigerate and chill for several hours or a few days until ready to fry). Preheat oven to 200°F; set an oven-safe serving platter or rimmed baking sheet lined with parchment on the center rack. In a small saucepan over medium heat, warm about 2 inches of oil (enough to submerge ball completely, but no more than half way up the pan) to 350° – 375°F. 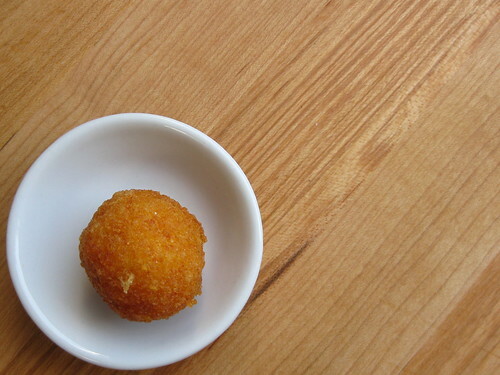 Once oil is heated, fry arancini in small batches until golden brown on the outside, about 2 – 3 minutes. Please note that they like to stick together, so be especially careful not to crowd the pan and do not try to separate them until after they’re removed from the oil — ignoring this advice will cause a surge of bubbles which may result in a very dangerous oil spillover. Drain on a paper towel-lined plate then transfer to the baking sheet in preheated oven to keep warm. Allow oil to recover (return to temp), and repeat with remaining balls. Serve arancini warm with Peppadew peppers on the side, if desired — their spicy/sweet/tangy taste complements the arancini nicely. A word of warning, a bit of orange grease from the nduja will leak through the bottom of the arancini (shown in the last photo above), so choose your serving platter wisely (read: not something unglazed or paper-based). Wondering….in our pre-GF days we would make a giant batch with relatives and freeze to fry as the months progressed. Wouldn’t this work the same way? Have you tried freezing them and using as needed? Though I haven’t tested it out with this particular recipe, I would imagine so — these are so addictive that it’s all too easy for a few people to eat a whole platter’s worth in one sitting :)! Definitely found that freezing then frying worked splendidly with classic arancini di riso.